Encouragement, Tips and Tools to Help you Build a Loving Marriage, Train Up Godly Children, and Bear Lasting Fruit, standing on the Firm Foundation of Faith in Jesus Christ. I went down the stairs loudly, not really on purpose, but if my children heard me, well, good. I put in the load of wash which I'd asked them to put in the washer and started the machine. Emptying the overfull lint-filter, I thought, "Don't they know better by now?" Huffing up the stairs, I saw out of the corner of my eye the vacuum cleaner which I'd asked to be put away, still sitting in the hallway. I marched down the hall, grabbed it and turned, a little too quickly, banging it into the woodwork as I turned. I felt a sharp prick in my conscience. If one of my children had done that, I would have told them to be more careful. Pulling and pushing the heavy and unwieldy object down the hall and around the corner, the Lord began talking to me. An image appeared in my mind. Jesus was bending down, washing the disciples' feet. In my mind's eye, the story played out, as though in a film. Jesus was kneeling in front of one of His disciples. I noticed that He wasn't moving quickly, or in an exaggerated manner. My heart convicted me. This little 30-second act of service I was doing for my children was hardly a sacrifice. It was nothing. Wasn't I willing to do that service? I put the vacuum away and closed the door. Going to the kitchen sink, I rewound the tape of my earlier words. "Drill sergeant" came to mind. I'd expected instantaneous response, when I don't respond that way myself. Jesus washing the disciples' feet. I saw it suddenly in a whole new light. You and I know the story well. Jesus was heading to the cross very shortly. He must have been feeling a lot of pressure. Under spiritual attack, no doubt. He had the weight of the world on His shoulders, definitely. The disciples were acting foolishly. Proud. Yes, they should have known better. They were being immature, selfish, perhaps lazy. Jesus would have been perfectly within His rights to be completely irritated with them, and to have ordered one of them to get down and start washing (or, at the very least, to join Him in washing feet). He would have been more than within His rights to give them a good sermon on what He was about to go through for them, and couldn't they show just a little consideration?! Jesus washed the disciples' feet (a dirty job and one that they should have seen and done themselves). You can almost hear the chorus of "NMJ: Not My Job" from the disciples. Jesus did it for them, as mothers often do work that they have asked their children to do, or that their children should have seen and done themselves. Mothers do much work for their children. The action of Jesus doing a dirty job isn't what was the point. Jesus' attitude was. He didn't do it with resentment, or in a huff. He showed them the act AND the attitude which He wanted them to emulate. He did it in love. And He said to go and do likewise. If ye know these things, happy are ye if ye do them." An easy, refreshing make-ahead dessert! This is the dessert we served on Easter Sunday. See the other recipes and about our day on "How to Make Easter Ham." Looking for luncheon or brunch recipes? It would also serve perfectly for a luncheon, brunch, or when you gather guests this summer for a grillout! Line a loaf pan (8x4inch) with foil. Mash 2 cups of strawberries in a large bowl. Stir in condensed milk, juice and 2 cups of the Cool Whip. Combine rest of the chopped cookies with the butter, and put on top of mixture in pan. Freeze at least 6 hours. Frost with the remaining Cool Whip. Top with the remaining strawberries, sliced. This next recipe is an old family favorite. My children prefer the cheese version. Serve it with ham, pork or meatloaf. It's very versatile and make-ahead, which makes it my kind of recipe. Combine the first 5 ingredients in a large bowl. Add the thawed hashbrowns and mix. Place in a 9x13-inch baking dish (glass works well). Place Corn Flakes in a quart-size plastic bag and crush using your hands or a rolling pin. Sprinkle crushed Corn Flakes and drizzle butter over the top of the hashbrown mixture. Before baking, take out of refrigerator for 20-30 minutes, and then bake at 350 degrees for 1 hour. If using a glass dish, place in oven while preheating. You'll know it's done when bubbling in the middle. A tornado in Alabama left homes flattened and a number dead, including a Homeschooling husband and father of 13, Tom Lee. Blogging friend, Berean Wife, and her family live in the area, but were graciously spared. Please pray for the Lees and the Crawfords, and all whose homes were destroyed. Kelly Crawford, of Generation Cedar, writes for LAF (Ladies Against Feminism) and At the Well. Both have related posts. Doug Phillips of Vision Forum has more details and video here. Despite the devastation, thankfulness is appropriate. (To participate and read other thankful hearts, visit Lynn at Spiritually Unequal Marriage. Thank you, Lynn, for hosting this month.) These families and those who've come to help are a powerful testimony of God's provision of faith, strength and peace in times of trouble. It's powerful to read of their thankfulness after they've lost everything. Despite the devastation, I am thankful to God for His mercy. Thankful to God for protection and the rapid response of Christian brothers and sisters from far and near. Thankful to God that there weren't more deaths. Our prayers are needed. Pray for provision, resources, aid. Pray that cleanup and rebuilding will go smoothly. Pray for comfort, peace and strength. Two places where you can give aid are Tornado Relief Efforts and (specifically for the Crawford family) at A Wise Woman Builds Her Home. Wash out and straighten the silverware drawer, the spice drawer, and any inside cupboards which need it. Thoroughly dust the Computer center area, the hutch, decorations, bookshelves. Clean out and organize the two cupboards beneath the other two bookshelves, and straighten the books. Rearrange the furniture, and vacuum the cushions, and underneath and behind the moved furniture. Change and/or wash the bedding: bedspreads, comforters, replace or clean pillows. Straighten drawers underneath our bed. Dust any cobwebs in corners or behind bedstands, etc. Wash out and straighten the medicine cabinet. I am nowhere near getting done with all these jobs:) It usually takes me all spring, summer and into the fall to get them all done, and often I don't make it, but it gives me "something to shoot for," as my husband always says. Do you do Spring Cleaning? What jobs are on your list? Read This and Be Encouraged! It's encouraging to realize that God has helped us through the week, sometimes in little ways. What did God use to keep you going this week? Post a word, a Bible verse, or any little thing which the Lord did this past week to strengthen, encourage and keep you hangin' in there, pressing on and looking up, and then link up! Don't Overlook the Little Things! Let's be looking for little "God-sightings"--and not miss the little ways He's helped us through the week--and then share them! The most encouraging thing sometimes is sharing my own discouragement and how God helped me through it by some very little thing. Don't think it has to be "big"--just share it! G(lad) R(ejoicing) E(ncouraged) A(nd) T(hankful)! Be glad in the Lord and rejoice! The word glad makes me think of the movie "Pollyanna." Do you remember it? Great family movie. Hayley Mills, in the title role, played the "glad game." When life handed her something unpleasant, she would think of something in the situation for which she could be glad! Her wise father taught her the "glad game" when, on the mission field, she received crutches, instead of a doll which she'd been longing for, in the missionary barrel. Seeing her deep disappointment, her father made up this game and encouraged her to find something she could be glad for in the crutches. After much thought, she realized she could be glad because she didn't need them! Pollyanna possessed an even and consistently cheerful disposition. The dictionary definition of the word disposition "implies customary moods and attitude toward the life around one." So, I asked myself, "What is my customary mood?" Pained, I had to admit that it is far from evenly and consistently cheerful, like Pollyanna's. That's when I started thinking: I need a jump start on Mondays. I need to be glad. Maybe you do, too. Add to the normal struggle to keep one's customary mood and attitude even and consistently cheerful the fact that everybody goes around saying how miserable Mondays are, and well, it's time for a change! There were two things the Lord did this week that greatly encouraged me. I was sitting on my sofa in the Family Room having some extended time of prayer, actually two different times (kind of unusual, lately) and the presence of the Lord moved in so real and so close. So real. So close. You know. Like you could actually reach out and touch Him. You feel like if you open your eyes you're going to see Him. I knew that He was there and I knew that He'd heard me! It was awesome. And I really, really needed that. And, the second thing was that you sent me comments on my blog and notes in the mail that were so warm and loving and specifically appreciative and encouraging, and you didn't know that I needed encouragement right then, but they came at just the right time. I don't tell you often enough, but I am glad for you, for what you write on your blogs, and what you say in your comments to me. Your continued desire to live your life for the Lord, and your not growing weary in well-doing, even when you suffer for doing right, and even when you're going through trials. That is such a huge and ongoing encouragement to me. So, be glad in the Lord and rejoice with me! And look for the little ways that God is helping you--and then post, comment, and link up next Monday! 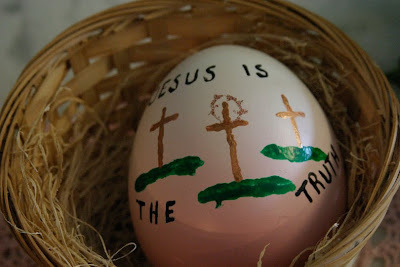 He is Risen--He is Risen Indeed!! Hallelujah, Jesus Christ is Risen Today! I thought you might be looking for some options for your Easter Dinner. Here is our menu and how I prepare Easter Ham! Also check out the other Food Friday recipe today for this delicious Refreshing Punch! Jellied Cranberries (I almost forgot to put these down! It's really very simple to bake a ham! I don't make it often, but it is a special traditional dish on Easter Sunday for many people. By the way, I have come to refer to Easter as "Resurrection Sunday"! 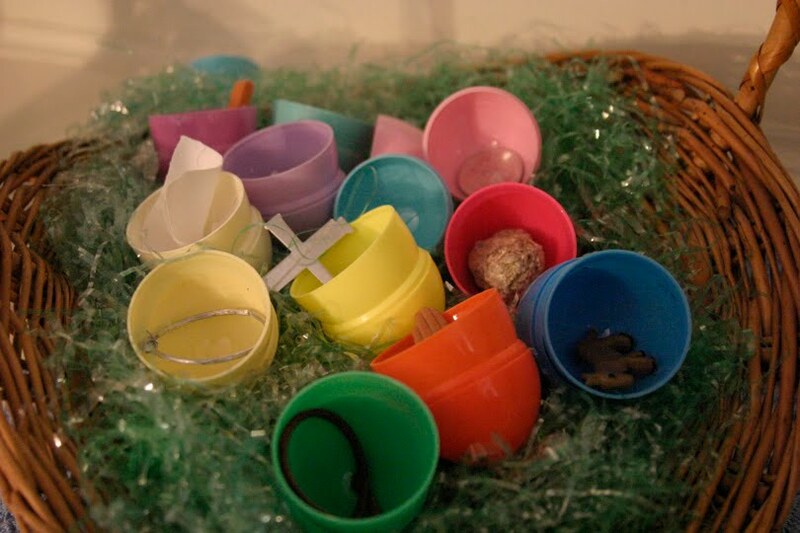 Last year I posted about Resurrection Eggs and an Egg hunt with our nieces and nephews--very cute photos! 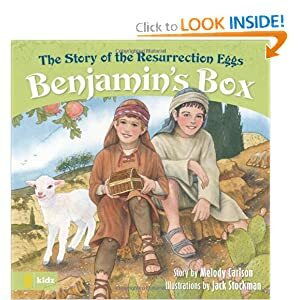 The book, "Benjamin's Box," tells about Resurrection Eggs, which help you teach your children about Jesus' death and resurrection. You can buy them at Family Life Today, among other places! We are having my mom and our good friend, Clarice, over for dinner--not a big gathering, but a special one. These instructions are for a non-spiral sliced, bone-in ham. They could be adapted to use with non-bone-in and spiral cut hams, though. This photo also shows maraschino cherries in the centers of the pineapple slices, which is pretty, but I don't use them, as I usually carve the ham before bringing it to the table, anyway, and the ham is sweet enough with the pineapple and brown sugar. Place the ham in a baking or shallow roasting pan (9x13) on top of a metal rack. Cut away some of the fat/skin on the top/side, and score it about a 1/2 inch deep, with a sharp knife. In a small bowl, mix together about a 1/4 cup (to start) of brown sugar, and about 2 Tbsp of regular mustard. You may wish to use more brown sugar if you like it sweeter, or more mustard, if you like that. This is to your taste. Spread the brown sugar mixture over the top and sides of the ham with a knife, spoon--not too thick, or it will just fall off. You can make more of this, and heat it in the microwave briefly, but I usually don't heat it. Place pineapple slices on sides and top of ham, anchoring with the cloves, (you can use toothpicks, but I usually don't need to). Just as best you can. I can usually only get a few of the pineapple slices to stay--but they do add sweetness! Poke whole cloves into the ham (these resemble little thorns, which is symbolic to me of Jesus' crown of thorns). Remove the fat where needed, so you can get them into the actual ham. Between or in the scored parts. Place them in a tic-tac-toe pattern, rows crossing each other, or just randomly, however you want. These, too, add flavor. Spread them all over the ham. I usually add a lot of these; maybe 20-30. Cover with a tent of foil, and place in a 325 degree oven (preheated). Check periodically, and add a little bit of water in the pan, if the drippings are burning on the bottom. Baste or brush with additional glaze, if you like, every 15-30 minutes. You can also baste with the pineapple juice, but it will burn on the bottom of your pan, if it runs down too much. Remove foil for the last half of baking, and continue to brush with glaze. Bake for 20 minutes per pound, or about 2 to 2-1/2 hours (until it reaches 140 degrees). Remove all cloves! You don't want to eat these!! Carve and serve with browned pineapple slices. Here is also a video of Rob Barrett cooking an Easter Ham, which I posted awhile ago, which shows him preparing and baking ham in a very similar way to what I have just described, so you can see how it can be done! Fun to watch, too! And remember our Lord's sacrifice and Victory over sin and death as you Celebrate Jesus Christ's Resurrection! How To Make Easter Ham is my other Food Friday recipe. Check it out! In color, this punch is a yellowish orange, which is nice for a spring or summer gathering. The base for this refreshing punch will keep in the freezer for a couple of months, ready when you need it, for impromptu special occasions. You can scrape the frozen mixture with a fork, or, if it's in a round bowl, it can be almost like a flavored ice ring. 39And he came out, and went, as he was wont, to the mount of Olives; and his disciples also followed him. 40And when he was at the place, he said unto them, Pray that ye enter not into temptation. 42Saying, Father, if thou be willing, remove this cup from me: nevertheless not my will, but thine, be done. 43And there appeared an angel unto him from heaven, strengthening him. 44And being in an agony he prayed more earnestly: and his sweat was as it were great drops of blood falling down to the ground. 46And said unto them, Why sleep ye? rise and pray, lest ye enter into temptation. It's Thankful Thursday, and, as my husband asked me to read this portion of Scripture, and the rest of Luke 22, this morning in our Family Devotions my heart felt the vulnerability of the Lord and his humanity, even as He is God and Christ. He has felt every emotion, every pain, every human experience which I will ever experience. He came to earth. He lived. He suffered. He gave. He served. That is His character. That is Who He is. But one thing stands out to me today. He could have said, "No." Enough. I'm not going there. Don't want to, don't have to, you can't make me. They're not worth it. There must be a better way. Send someone else. But my Lord and Savior Jesus Christ suffered. Agony. Needed comfort and strength from an angel in His deepest need. Asked God to take the cup away. But in the end He went. He died. He was the Man. He was and is the Savior. He loved. He loves. He gave more than anyone before. More than anyone now or ever. He finished the work that needed to be done. There is nothing more to do. Nothing more needed. "It is finished." 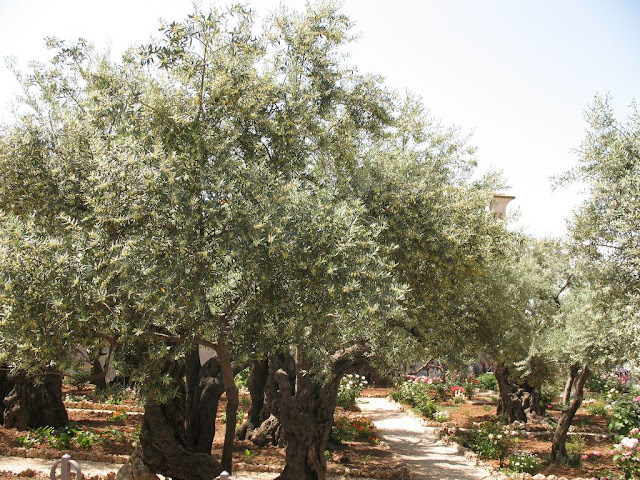 As I look to the cross, in anticipation of the tomb and the resurrection, I pause here in the garden to say, "Thank You, Jesus." When God says in His Word for us to do something, what do we do? It's really very simple. When we ask our child to go and clean their room, what if they come back a couple of hours later, and tell us they have memorized what we said to them? They can say it back to us in Greek. They tell us they are having a few friends over and they are going to do a study on how to clean their room? Hmmm. He compared God's Word and voice to your GPS. We have made some wrong turns. We hear God's voice saying, "Recalculating." We need to look to His Word for directions and listen. He says, "I can still get you there. It's going to take longer, but I can get you there. But you have to listen to Me now." My daughter drove all over the western suburbs of the city and out into the countryside today, using our GPS to direct her way. We got a phone call about the time she was supposed to be arriving at her Bible Study tonight. The GPS had led her astray, quite a ways from her true destination. She was going to be about 15-20 minutes late. We were able to help her find out where she was and how to get back to where she needed to be, but her "faith" in the GPS was a little shaken! That is one problem we will never have when we rely on God's Word to guide us. God will never lead us in the wrong direction or astray. We can put our complete trust and confidence in what He tells us to do. We can run in the direction He tells us to go! He is utterly faithful. His Word is sure. Psalm 27:11 says, "Teach me thy way, O LORD, and lead me in a plain path, because of mine enemies." This is really saying, "Lead me in a plain path, because of those which observe me." There are people following me, Lord. Don't let me get lost, or go off in the wrong direction, because they will get off track, too! And those who are observing me, will judge You, and Your ways, by watching the path I take. Please lead me in a plain path for their sakes, and for the sake of Your Good Name, Lord. save me for thy mercies' sake." Today the sun is shining brightly! What a difference that makes in my mood! I'm reminded that the spiritual equivalent of the sun is the SON! Jesus Christ, (and God the Father, and the Holy Spirit--for they are one) is the sunshine that I need every day, shining on my face. 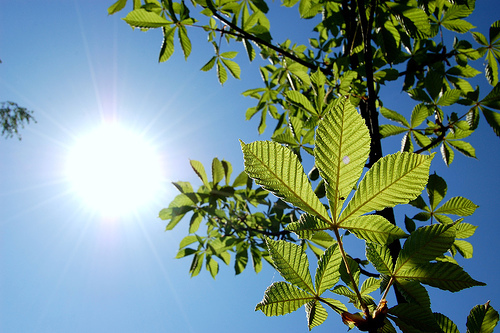 The sunshine outside affects my mood partly because I receive vitamin D from it. I don't have to know all the intricacies of vitamins and sunshine's role in my emotional and physical health to enjoy the benefits of it shining on my face. And I don't have to understand how it's going to help before I obey the Lord's instructions to me throughout His Word to look to Him in the morning, praise Him, rejoice in Him, and be glad. As the saying goes, "Just Do It." Recently, I was home alone from church, feeling a little under the weather, and I was trying to catch up in my scheduled Bible reading. I read Psalm 26-40 and was suddenly struck by the frequent command in Psalms to rejoice! And be glad! Now, what if I don't feel glad? What if I'm feeling a bit blue? What if I'm feeling downright depressed, in fact? It doesn't seem to matter much to the Lord. Over and over in Psalms He commands us to rejoice, be glad and sing praises to His Name! Since, within these same psalms, there is often a dreadful description of horrible happenings which the psalmist is bemoaning, I can only surmise that God is not saying that I should wait to be glad and rejoice until everything is going smoothly, and I'm feeling "hunky-dory" again. So, if I'm not supposed to wait until I feel happy to rejoice, my thoughts continued, "How do I obey this command? How does one say, 'Ok, I'm going to start rejoicing now!' How does one begin to rejoice?" Wondering how to begin, and feeling a little foolish, for surely there are a multitude of things over which to rejoice, I felt God's presence suddenly. As though He was looking at me, gently but sadly quizzical. "You're having trouble beginning to rejoice? You can't think of anything?" "Well, no, Lord, that's not it. Not really." So, thinking of it from His perspective, I began by recalling all the rich realities in the heavenly realm which God would consider worthy of my rejoicing over. I began to pray, "God, You created me, You love me, You sent Your only begotten Son, Jesus Christ, to die for me. I don't deserve any of it. I'm going to go to heaven and be with You because of Your sacrifice..."
From there it was easy to begin thanking Him for my many earthly blessings. "Thank You for my husband: He loves You, and gets up very early every day to study Your Word, he provides for us, he takes care of things around the house--like fixing my dishwasher and the car when they don't work. He cares about the condition of our home and works to make it look nice--he raked the acre of grass just last week. And thank You for the children you've given me: my two children are wonderful, they love You, Lord, they are responsible, they make us proud, they want to do what's right, they help us so much, they're funny and kind and fun to have around. And thank you for my home and, and, and......"
And you know what? As I remembered His marvelous goodness to me, I recognized true gladness in my spirit and emotions! And I rejoiced and was glad in the Lord! The Son is shining brightly today! What a difference that makes in my mood!